In the earlier posting, we saw how Janata Party rose to power with sweeping majority in 1977 and got split into various factions within two years. Charan Singh, the Deputy Prime Minister, who had an ambition of becoming PM, was wooed by Indira Gandhi to come out of Janata Party and to form the Government with outside support of Congress. Accordingly, he withdrew from Janata Party Government along with 64 of his erstwhile members of Lok Dal. Bharatiya Jan Singh (BJS) component of Janata Party led by Vajpayee and LK Advani also withdrew the support to form Bharatiya Janata Party (BJP). Morarji Government lost the confidence vote in Lok Sabha and submitted his resignation. Chaudhary Charan Singh (Present Cabinet Minister Ajit Singh's father) claimed to become the PM with the outside support of Congress led by Indira Gandhi. Charan Singh had only 64 Members on his side. He was sworn in as 7th Prime Minister of India on 28th July 1979. Even before he could prove his majority in the Lok Sabha, Indira Gandhi withdrew her support to Charan Singh. President of India dissolved the Lok Sabha and ordered fresh elections. That was the end of the first Non-Congress Government formed by multiple parties with different ideologies. The first experiment of coalition Government failed in India. Political analysts feel that the manipulative and cunning tactics of Indira Gandhi divided her enemies to her advantage. We will see later in this article, how her manipulative tactics created problems in Punjab, leading to her assassination. 7th General Elections were held on 3rd and 6th Jan 1980. 59.6% of the voters participated in the General Elections. Since the Janata party got split into various factions due to their internal fight and political ambition, people got frustrated with the instability of the Government. Not withstanding the emergency excesses and agonies, people voted Indira Gandhi back to power. Congress and her alliance parties won 374 seats. Congress alone got 353 seats (42.7% vote share), as against 189 seats (41% vote share) in 1977. Though the vote share of Congress has marginally increased only by 1.7%, because of the split of opposition parties, Congress could bag 353 seats. Janata Party and its allies got only 34 seats. Janata party individually got ony 31 seats (19% vote share), as against 295 seats (41.3% vote share) in 1977. The reduction of vote share has happened due to the split of Janata Party into various factions. Left parties bagged 53 seats. Interestingly, DMK who was with Janata Party, because of the sufferings of Emergency, shifted its support to Indira Gandhi in 1980. AIADMK led by MG Ramachandran, who was earlier with Indira Gandhi, shifted his support to Janata Party. With the sweeping majority of 353 seats, Indira Gandhi became the 8th Prime Minister of India on 14th January 1980. P V Narasimha Rao (who became PM later), R Venkatraman (who became President of India later) and Zail Singh (who became President of India later) were the cabinet ministers in the Indira Gandhi cabinet. 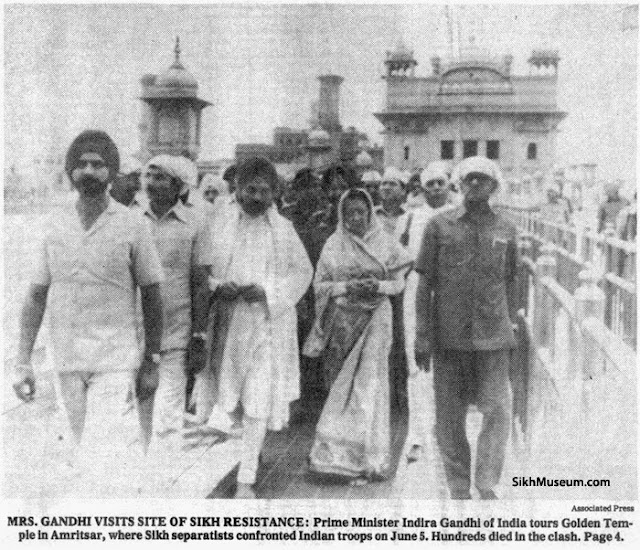 Indira Gandhi ordered a military operation code worded 'Operation Blue Star' in Jan 1984. Around 10000 jawans from Indian Army, CRPF, BSF and Punjab Police were involved in this operation to kill the extremists headed by Bhindranwale, who were hiding in the Golden Temple at Amritsar. The army men entered Golden Temple and conducted the operations. 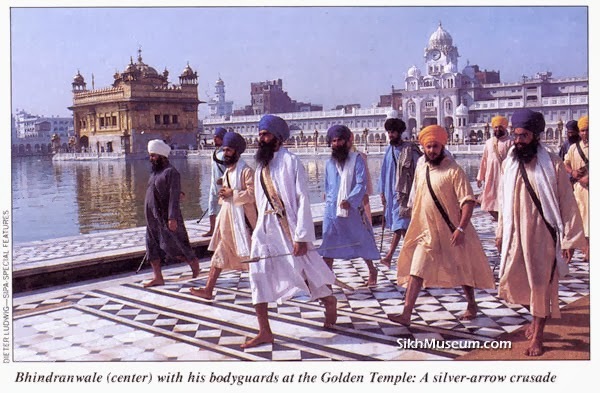 In the process Bhindranwale and 140 militants were killed inside the Golden Temple. Golden Temple is the holiest place for Sikh Community. 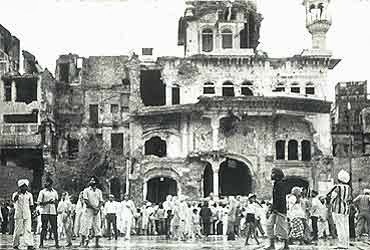 Thousands of civilians also died in the operation both inside and outside the Golden Temple. Though official figure indicated the death of 492 civilians, media reported estimated death of more than 5000 civilians. During the time of Operation Blue Star no media was permitted for nearly 14 days. Earlier in 1982, to reduce the supremacy of Akali Dal (who were with Janata Party in 1977), Indira Gandhi encouraged and helped Bhindranwale to become the head of the radical wing of Akali parties. Unfortunately, it got backfired and he became a powerful messiah and Punjab's big religious leader. One of the foreign journalists wrote, "Indira Gandhi created a monster, which she could not control'. 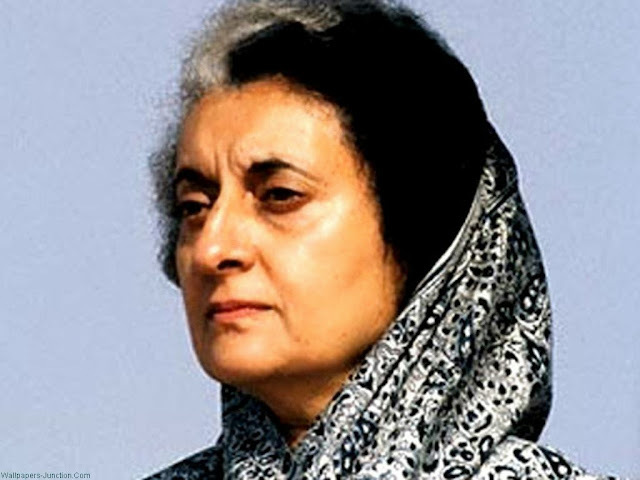 Indira Gandhi became the victim of her own manipulative tactics. She had to order 'operation blue star' to eliminate all the militant groups led by Bhindranwale, who were living in Golden Temple. The entry of army personnel into Golden Temple and damaging their holy place created anger among the Sikh Community worldwide. Many Sikh people resigned army and Government jobs. Though Sikh Community is less than 2% of the population, the military cannot function without their support. They are known for their bravery and commitment. To assuage the hurt feelings of the Sikh Community, Indira Gandhi visited the Golden Temple on 23rd June 1984. She also ordered reconstruction of damaged portions of the Golden Temple during the operation blue star. Since the operation blue star had hurt the religious sentiments of the Sikh community, some people had developed vengeance against her. On 31st October 1984, when she was walking on the foot path of her residence, two of her body guards Satwant Singh and Beant Singh assassinated her by firing bullets on her chest. Rajiv Gandhi, son of Indira Gandhi never took interest in politics. But Indira Gandhi wanted him to enter into politics. When Indira Gandhi was assassinated, Rajiv Gandhi was in Calcutta. On his arrival, then President of India Zail Singh made him as the Prime Minister of India. 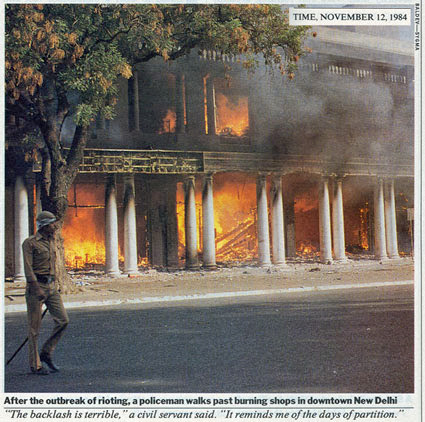 After the assassination of Indira Gandhi, riot broke throughout India. Sikh community was targetted. In Delhi alone more than 3000 Sikh community people were killed by anti-social elements. It is estimated that throughout India more than 6000 people might have been killed. In spite of Congress leaders encouraging communal riot, many of the Sikh families were protected by Hindus throughout India. Even now, many of the Sikh community people who witnessed 1984 riot, would explain how they were protected by other community people, from the anti-social elements. Jagadish Tytler, Sajjan Kumar, HKL Bhagat, the senior Congress leaders were reported to have been responsible for this riot, mass killing and genocide. Though cases have been booked against them in 1984, till date, nobody has been punished. 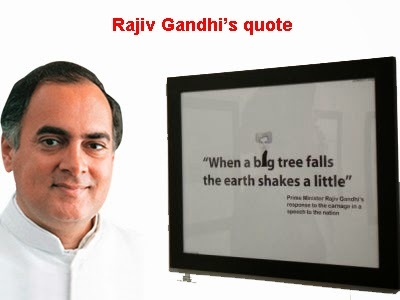 To add fuel to fire, Rajiv Gandhi, the then Prime Minister said, "When a big tree falls, the earth below shakes a little". This statement created fury among the people and it was largely criticised. At the request of the Prime Minister Rajiv Gandhi, President of India dissolved the Lok Sabha and ordered fresh elections. Fresh elections were held in December 1984. due to sympathy wave, Rajiv Gandhi secured 416 seats out of 515 seats, for which elections were held. (Elections were not held in Punjab and Assam) He formed the Government in Dec 1984. In our next posting, we will look at the rise and fall of Rajiv Gandhi.